Approximately half of all adults have some form of gum disease but may not realise it. Better known as periodontitis, this oral infection affects both the stability of teeth as well as the overall immune system. 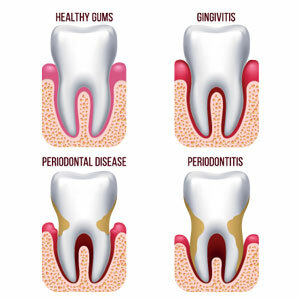 Gum disease starts out as gingivitis. When left untreated, plaque biofilm accumulates deeper under the gingival tissue, triggering detachment of the ligaments that hold the tooth in place. This process causes the development of deep “pockets” between the teeth and the gingiva. When viewed on an X-ray, bone loss can also be seen around the affected areas. Untreated periodontal disease facilitates conditions where oral biofilm can spread directly into the cardiovascular system to become lodged elsewhere in the body, including the heart and cranial arteries. Individuals with gum disease are much more likely to experience medical problems like pneumonia, diabetes, stroke, heart attack, infertility and premature labour. By eliminating the oral infection from their bodies, our patients can enhance their overall health and ability for their immune system to ward off other underlying issues. Periodontal treatments typically involve a series of scaling and root planings to remove calcified bacteria below the gumlines. If the areas are sensitive, local anaesthetic may be used. Pocket reduction and bone regeneration may be needed to stabilise pockets of advanced disease, to prevent loss of the teeth. If you suspect that you have periodontitis or gum disease runs in your family, we invite you to schedule a comprehensive exam at your earliest convenience.